The former banker who joined Parramatta Lifeline as a financial adviser about nine years ago has seen his client list expand exponentially in the last three years. "I've been doing this for about nine years now and up until about three-and-a-half years ago I'd see one client a year with a mortgage problem," Mr Young said. "I'm now seeing one client a week if not two a week and I only work two days a week. (Mortgage stress) is alive and well." The biggest myth about mortgage arrears and home repossessions, according to Mr Young, is that the problem is confined to single-income, struggling families. "It's not just the down and outers, a lot of the people I'm talking to are your upwardly mobiles where the thing to do is buy your investment property," he said. Successive interest rate hikes and spiralling living costs have combined with falling house prices across much of Sydney's west, he said. Abbotsbury father-of-two Gil is a victim of this cycle. The 55-year-old steel industry manager bought a two-bedroom townhouse at Rooty Hill in 2003 as an investment, in the hope of having some "money on the side" during retirement. He fixed the majority of the loan at 7.19 per cent but the rest is variable and currently sitting just above 9 per cent. Gil, who did not want his surname published, says the real estate agent's "flashy and glittering sales pitch" about the potential capital growth and using equity in his first home, plus a loan to minimise his tax burden, were false promises. His initial investment of $305,000 would now fetch just $265,000. "When the property market was going up and up I thought I can't lose," Gil said. "It was a bit late for me to do it, then I should have realised (the market) was too high. My only hope to keep this property is if the banks start lowering their rates in conjunction with the RBA." He says the big banks' reluctance to pass on rate cuts was insulting. "It's the banks thinking they won't have to put our interest rates down that really pissed me off," he said. "Why don't they look within their smug little world and see what they can do to fix the problem because that's where it stemmed from and it was their decision-making that got us all in this predicament." NSW Housing Minister David Borger, who is also the Member of Granville, criticised lenders for being too soft on financial checks and documentation. But industry representatives said it was up to banks to decide which loans to approve. "Unfortunately there are some fringe lenders in our industry and we are determined to rid our industry of these unscrupulous operators," Mortgage and Finance Association of Australia chief executive Phil Naylor said. "The very small minority of brokers and lenders who recommend loans inappropriate for a borrower's needs are a blight on our whole industry." 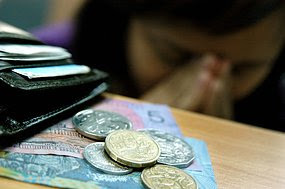 Darren Murphy, from the Parramatta-based Loan Management Centre, said worried homeowners should ask for help as soon as possible. "People will leave it until they're three months in arrears before they put their hand up," Mr Murphy said. "If people sought advice and help from professionals sooner rather than later then they'd give themselves wider choices. The client list at the Salvation Army's Moneycare counselling service has also long reflected this week's Reserve Bank of Australia Financial Stability Review. Moneycare co-ordinator Tony Devlin said mortgage payment problems had grown from 10 per cent to half of the service's work. Most families were victims of poor lending practices coupled with sheer bad luck, Mr Devlin said. "It's not reckless spending, they've lost their job, there's been an illness, a partner has died," he said. "Couple that with easy access to debt and it becomes a huge problem."